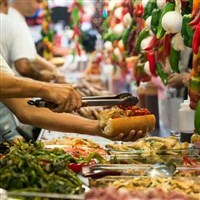 New York's largest festival, The Feast of San Gennaro, will draw more than one-million people from around the world to participate is parades, religous processions, musical performances and, of course to overindulge in the variety of Italian foods offered. The New York festival, an 11-day salute to the patron saint of Naples, is run by Figli di San Gennaro (Children of San Gennaro), a non-profit organization devoted to preserving the spirit and faith of the early Italian community. More than one-million people from around the world flock to the Feast of San Gennaro to participate in the parades, religious processions, musical performances  and, of course to overindulge in the variety of Italian foods offered. The Feast of San Gennaro is located along Mulberry Street between Canal and Houston Streets. The festival stage is located on the corner of Grand and Motts Streets. Bus will Depart New York at 6:00pm from the same location that you were dropped off. - Please check with your tour director for more information regarding this location before disembarking for the day.